Senate Democratic Leader Chuck Schumer of New York and other top Democrats sent a letter to President Trump yesterday, laying out five tough demands ahead of Trump’s summit with North Korea later this month, including “verifiable and irreversible dismantlement of North Korea’s nuclear program.” Schumer spoke with NPR’s Rachel Martin on Monday afternoon in his office at the Capitol. You and other top Democrats have sent this letter to President Trump outlining how you think his administration should move forward in negotiations with North Korea. You agree that the goal should be quote “complete, verifiable and irreversible dismantlement of North Korea’s nuclear program.” As part of that, you write, “No concessions should be granted that could undermine our core alliance commitments or our posture in the region.” Are you concerned that the Trump administration would offer concessions without getting enough in return? Yeah, the worry we have is the president will be so eager for quote, “an agreement,” that it won’t protect the security, first and foremost, of the United States. When you have North Korea with ICBM capability and nuclear capability, it’s extremely dangerous to have an agreement that doesn’t dismantle that and remove the danger from the United States — would be really troublesome for it to continue. And secondarily, we’ve had allies that we’ve had since World War II — in South Korea and Japan in particular, Australia on the periphery, Philippines — and we have to do things in accord with them and protect their security as well. Why did you feel it important to write this letter? I mean, do you have any evidence that would suggest that the administration wouldn’t also be concerned about those issues? The administration has been somewhat erratic in how it has done this. They’ve moved rather precipitously without real guidelines in effect. And everyone knows that there are many times when Donald Trump likes the show of it ,as opposed to the substance of it. And the substance is vital here because our security is at stake. Now we may be wrong on this. Maybe he’s gonna you know, just demand the kinds of things that we’ve requested. So, so much for the — that would be so much better, and we hope it happens. But we’ve got to be … we have to set out, set out signals that that is a bottom line, not just gratuitous. How do you reinforce the bottom line? I mean is this just talk at this point? What, what mechanism do you have, what leverage do you have to make sure that the administration does what you want them to do? Well first, first I think laying out five principles clearly does set some real, some real parameters that the public — the American public — will judge the president by. Second, obviously if he comes to an agreement, one of the things that North Korea wants most is removal of sanctions. And in the past when it comes to Russia and others, in a bipartisan way when Congress has not agreed with what the president has done, we have taken away his ability to waive sanctions. That’s something that you could see happening again. It’s very possible, because a good number of our Republican colleagues — probably I don’t think they’d send him a letter publicly, that’s you know because they’re of the same party, but a good number of our Republican colleagues agree with every one of these principles. And realize, I think bipartisan, realize the danger to America if North Korea continues on the path it’s continued. But it has to be a give-and-take — in any negotiation North Korea’s going to expect something. Well what North Korea will expect is being welcomed into the community of nations, being able to trade economically, and things like that. And those are fine incentives, but they ought only to be granted when we achieve our goals — not ahead of time. In the past North Korea has proved to be a very unreliable negotiating partner — they promised things and backed off, they’ve lied, and we have to really be strong here. Because the danger is much greater than in previous negotiations, because North Korea’s nuclear capability is large, and for the first time it seems quite clear that they have ICBMs. Let me ask you also in the letter you — you urged the president to continue to take a quote “tough approach” to China, to make sure that China’s doing everything it can to make sure North Korea is complying with any potential deal. Are the Trump administration’s new trade tariffs on China part of that? I mean do you believe those tariffs are a good idea? One doesn’t know. I believe that I have said repeatedly that my views on trade with China — not trade in the rest of the world, but on trade with China — are closer to President Trump’s than they were to President Obama or President Bush. We need to be really tough on China for economic reasons. So you like what he’s doing? You like these sanctions? This is the Chinese telecom that Donald Trump propped up. The Chinese telecom. Golden opportunity to show the Chinese we meant business — he talked tough and then backed off. So we don’t know where it’s going to end up with China because again, sort of like with North Korea, the administration’s a) been erratic and b) has different voices saying different things. You know — secretary of Treasury seems to be different than [U.S. Trade Representative Robert] Lighthizer and [Director of the White House National Trade Council Peter] Navarro. So we have to wait and see, but if the president were tough on China I think it would have two benefits: One, that would make China more, not less, inclined to help us on North Korea, because that is the mother lode — that’s what they care about. But B) and maybe just as importantly, China has been stealing our intellectual property, our jobs, our wealth for 20 years. Gen. Keith Alexander (hardly a hyperbolic man, a four-star general who was head of cybersecurity) said, and this plagues me: no — there has been no greater transfer of wealth in the history of the world as has occurred in the last 20 years as China, Chinese companies have stolen the intellectual property of American companies. That can’t be allowed to continue or our economy will eventually sink. So you like the focus, at least — when you said you’re closer to Donald Trump than you were to Barack Obama on this issue — you like the focus that this president is putting on China and trade? I don’t think either previous president did much to show China they meant business. Trump has talked about it; he hasn’t yet done it. B ut let’s wait and see. The backing off of ZTE disappointed both — when the president backed off on sanctions against ZTE, which really damages our national security if they were to be allowed here, both parties reacted strongly, and it looks like Congress will overrule the president and not allow him to undo the sanctions. But if I could ask you just yes or no … do you approve of these tariffs on steel and aluminum against China? Steel and aluminum have not been directed at China. Steel — China does not, does not send us much steel or much aluminum. Those have been more directed at Mexico, at Canada at the EU. And my view is we should be in alliance with them, pushing China to do more, as opposed to having these other skirmishes right now. Now that doesn’t mean, you know — I think we have to be tougher on trade in general, but China should be the number one focus. And the steel and aluminum do not make China the number one focus. I want to ask you … Republican Sen. Bob Corker of Tennessee tweeted out over the weekend: “I am working with like-minded Republican senators on ways to push back on the president using authorities in ways never intended and that are damaging to our country and our allies. Will Democrats join us?” Sen. Corker there referring to the president’s trade positions. The Democrats have already joined with Republicans on saying, for instance, that the president cannot remove these sanctions that commerce opposed on ZTE. On what … I’m not sure what Sen. Corker has in mind; I’d certainly be open to talking to him. Midterm elections are rapidly approaching, primaries are already well underway. The Senate Majority Leader Mitch McConnell said late last week that control of the Senate is absolutely in play. Do you agree? I think, you know, the conventional wisdom is very hard for Democrats to take back the Senate when you look at the geography from 10,000 feet. When you look at what’s happening in each state, McConnell’s right — it’s definitely in play. Does President Trump deserve any credit for the strong economy right now? Look, the bottom line is we’ve had better years under President Obama in terms of the major criteria — job growth, wage growth — than this year. So I think Obama deserves most of the credit. If you — the tax cut that the president enacted may give some temporary lift to the economy, but it’s mainly aimed at the top 10 percent and 1 percent. And the middle class — that one bill, which contained things that are detrimental to health care premiums, probably took more away from the middle class than it gave. Are you worried that voters see you as the resistance — a party defined in its opposition to President Trump? We work with the president when we can — trying to on China, trying to here on North Korea; when he’s wrong, we oppose him. We have to be guided by our own internal gyroscope. Plain and simple. We should make it clear the president says he’s done nothing wrong, but it is within his power, he argues, to pardon himself. His own lawyer Rudy Giuliani says that would be impeachable; it would be politically untenable. If he were to pardon himself, is that something that — would you move towards impeachment? Look, let’s hope the president doesn’t do that, plain and simple — we don’t want to get to the point where there is a constitutional crisis. And we’ve been doing everything we can to urge the president to avoid it. But I’ll say this: For someone who keeps loudly proclaiming his innocence, he sure doesn’t act like it. If he did, then why would he want to talk about pardoning himself? Lastly, your Democratic colleagues Heidi Heitkamp and Claire McCaskill have been openly critical of Hillary Clinton — comments that she has made about people who voted for Donald Trump. Now former President Bill Clinton has made comments to the press this week about his own impeachment. Are Bill and Hillary Clinton still helpful as public faces of the Democratic Party? You know, I haven’t heard Bill Clinton’s comments, I just got here — but the bottom line is Democrats have to put forward a positive, strong economic program. We have to oppose Donald Trump when he’s wrong, but we also have sit and do positive things. So hypotheticals, who’s good who’s bad — we have to focus on the things that average, working-class, middle-class Americans need. You’ve known Donald Trump a long time. In the beginning, about a year ago, it seemed like you were kind of getting along. You know, we still talk to each other. How often, would you say? Every so often. I can give you an exact moment: I talked to him a couple of weeks ago on trade. I called and we talked for a half hour, encouraging him to be strong on China. He had his advisers there. How’s your relationship? How would you characterize it now? Well, we are certainly adversaries, and I think he’s doing damage to our democracy and damage to the middle class in this country –I don’t think he’s kept his promises. But I’ll never cut off a line of communication. 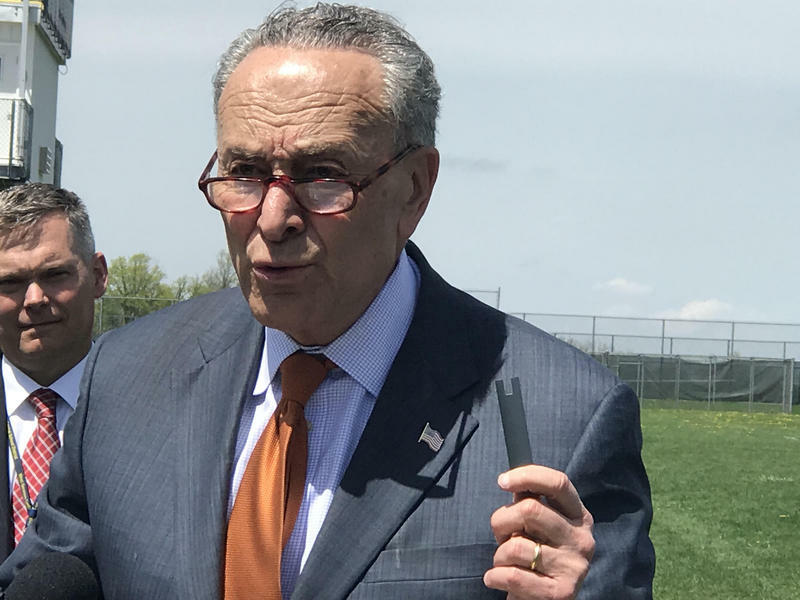 Senate Minority — Senate Minority Leader Chuck Schumer, thank you for your time sir.